…his works appear traditional, Kenner’s focus on the present makes him somewhat of a modernist. For he knew that if his work was nothing more than traditional, they would lack conviction and meaning in a world undergoing terrific upheaval and change in social, political and economic terms…. Kenner’s realist camp-life art manages to be ‘radical’ because Kenner recognized and understood the contradiction it embodied that enabled him to experiment continually in all sorts of ways…. [his works represent] a constant dialogue between impulse and precision, a dialogue expressed through an unusually close harmony of hand and mind. I had again finished a series of water colors and sent them out to my friend at London. Later I learned that the address was lost and the parcel sold by auction. Half a years arduous work was gone, and with it the joy to continue painting; especially after a colleague had taken over night out of my over-coat pocket, (while I slept), my warm leather sketching gloves. (Kenner, n.d. : 33). Further details of Kenner’s experiences come from the journal which he used to record his experiences and thoughts on his internment (although this seems to have been completed some years later). 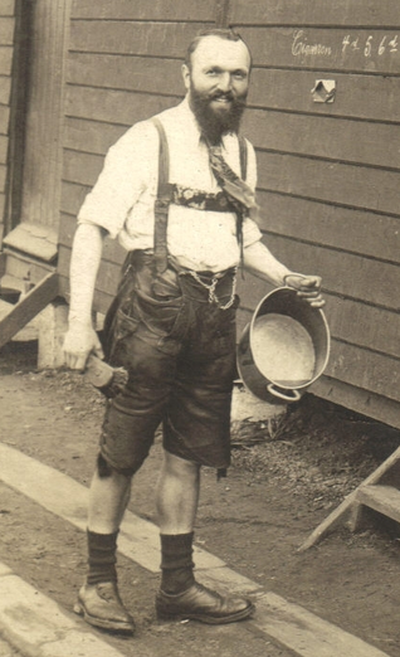 Kenner was released from Knockaloe in March 1919 and was repatriated to Germany, where he met and married fellow artist Margarete Bohne in Munich (1921). The social and economic crisis’ in Germany at the time meant it was difficult for him to pursue his art, but through his business contacts in London he was able to receive supplies. Kenner and his family moved to the United States where they settled in Pennsylvania (1927) and where he became a commercial artist. Much of Kenner’s personal archive and his artwork were lodged with the Imperial War Museum London and exhibited at Bruce Castle Museum in Haringey, Manx National Heritage and Surrey Heath Museum (2005). 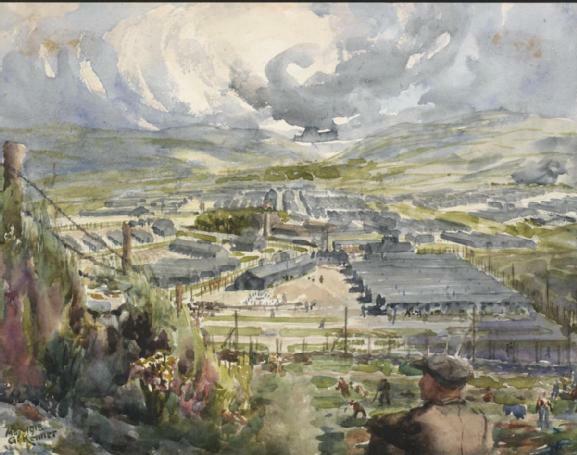 Knockaloe Internment Camp, on the Isle of Man, 1918. © George Kenner estate. Donohoe, V. (2005). ‘Prison-camp life produces artwork of dichotomies George Kenner's work is traditional yet modern, impulsive yet precise, radical yet safe’. (http://articles.philly.com/2005-06-05/news/25437337_1_internment-camp-painting-camp-life, accessed 19 March 2013). Kenner, G. (n.d.). Sketches of a German Interned Civilian Prisoner in England (1914-1919). unpublished. Kenner Bedford, C. (2011). ‘George Kenner Biography. My Father - George Kenner – Memories’. (http://www.myspace.com/cvkbedford/blog/543521299, accessed 19 March 2013).